On the 28th of July, 1821 – behind the decadence of the Viceroyalty and after a series of political movements with the introduction of the emancipation – the general, José de San Martín, proclaimed Perú’s independence, starting the Republican era. Its colonial convents and mansions are still proudly preserved, and today it is a modern city in constant growth, but has managed to remain maintained at the same time; the richness of its historic center has been declared by UNESCO to be a “Cultural Heritage of the World” because of the fact that is a charming haven from a bygone era, steeped in incomparable artistic monuments. 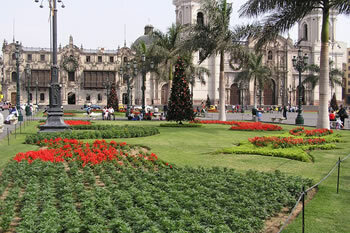 Main Plaza – Its placement is on the remains of the palace of Taulichusco – cacique of Lima – and, in its current perimeter are the: Government Palace, the Cathedral, the Archbishop's , and the Municipal Palace. 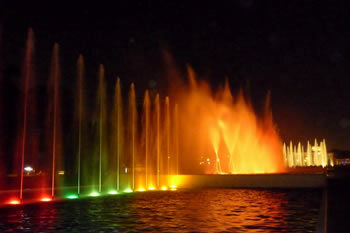 Cathedral of Lima – It is found in the Main Plaza and was first constructed the same day as the city’s founding – on the day of January 18th, 1535; originally a modest temple that was redesigned in 1564 to be a temple of grand dimensions (like the Cathedral of Seville), the Cathedral’s interior is highlighted by its corral seating, its churrigueresca Chapel of the Immaculate, its Cristo de Marfil – donated by King Carlos V of Spain, and the resting remains of Francisco Pizarro. Santo Domnigo – This antique convent, which by its architectonic characteristics is one of the most harmonious corners of the city, is formed by a succession of cloisters and patios around which are distributed service areas and community stands; to the left of the major alter the resting remains of Santa Rosa de Lima, San Martín de Porres, and Beato Juan Masías can be found. San Francisco – This architectonic construction whose magnificent unity of color and volume has caused it to be considered as the most advanced monumental environment in Hispanic-America started to be constructed in 1542 and was finished in 1674; its convent, cloisters, and porter's lodge are adorned Sevillian tiles – and, underneath them there are underground galleries or catacombs served as a cemetery during the Viceroyal period. 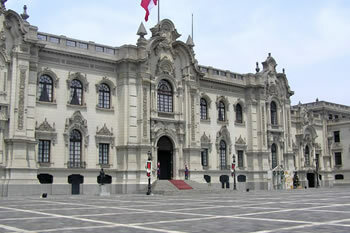 Museums and Casonas – Tagle Tower, House of Pilatos, Osambela Palace, Museum of the Nation, National Museum of Anthropology and Archeology, National Museum of History, Gold Museum of Perú, Amano Museum, Museum of Italian Art, Museum of Art, Larco Herrera Museum, and others – these museums show the beauty of colonial architecture and permit visitors the opportunity to appreciate the complete history of Perú that started with the Imperial Inka Empire and leads up to our time period. Archaeological Zones of Huallamarca and Pucllana – These zones are nestled in the center of modern districts such as San Isidro and Miraflores and contain very attractive museums. 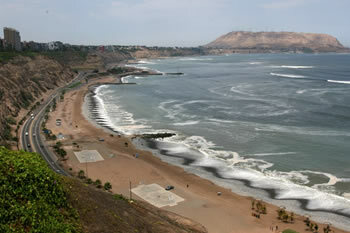 Barranco District – Within this district which still maintains the features that come from the first years of the Republican era visitors will find prestigious artists and writers – as well as typical taverns, pubs, and restaurants. The Green Coast – This beach zone unites six districts within the capital that are easily and quickly accessible; this coast is very attractive for those who love the ocean and who would like swim, practice surfing, or would like to take part in paragliding.